Built in 2006, apart from the unique exterior layout the Atlantis 39 comes equipped with two Volvo Penta 310 engines. The Atlantis 39 sleeps four and has two bathrooms. Electronics include compass, autopilot, CD and DVD player, GPS, three TV sets, VHF and depth sounder. Galley includes microwave oven, refrigeration. Heating and air conditioning throughout. The Atlantis 39 has been lovingly kept to a high standard. Built in 2004, the Atlantis 42 is equipped with two Volvo Penta KAD 300 engines. Owner’s and guest cabin and salon equipped with Satellite LCD TV. The Kitchen is equipped with an oven, fridge, freeze, microwave. Nautical Instruments include echo sounder, GPS, Radar, Auto Pilot, Card Plotter. Installed technical equipment consist of Shorepower 220 Volt, Generator, Battery, Battery charger, Battery main switch, search light, anchor box, eElectric Bow anchor winch and Drainage pump. Other features include swim platform, electric / hydraulic gangway, pressure water and water heating systems. 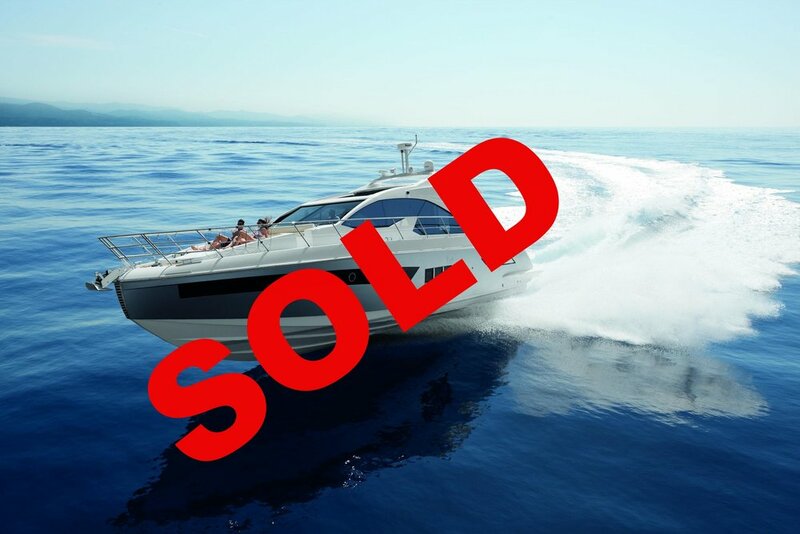 The Azimut 55S is a 2014 model, with just 163 hours of use, comes equipped with 3 x 435 Hp Volvo Penta D6 engines and a number of electronic navigation tools some of which include AIS, Autopilot, Chartplotter, Compass, Depth Sounder, Electronic engine control, GPS, Radar, Radar Antenna, Rudder angle indicator, VHF Radio. Included in the price are an Anchor, Anchor Chain Washdown, Automatic Bilge Pump, Auto-Trim, Batteries, Battery charger, Bilge Alarm, Bow Thruster, Bow Winches, Courtesy Lights, Deck Shower, Draining System, Electric Bilge Pump, Engine Alarm, Entry door, Fire Extinguishing System, Flaps Indicators, Gangway and winch. A well equipped kitchen and a number of domestic and entertainment facilities on board complete this package. The Pershing 50 Cayenne Petit is a 2009 model, with 600 hours of use, and equipped with 2 x 800 Hp Man CR engines as well as electronic navigation tools which include Autopilot, Chain counter, Chartplotter, Compass, Depth Sounder, Electronic engine control, Radar, Rudder angle indicator, VHF Radio. This model also comes with Anchor, Automatic Bilge Pump, Batteries and charger, Bilge Alarm, Bow Thruster, Courtesy Lights, Deck Shower, Draining System, Engine Alarm, Flaps Indicators, Gangway, Hard top, Horn, Hydraulic Flaps, Platform, Shorepower connector, swimming ladder., electric canopy. Six people can be accommodated in three cabins plus a crew cabin. Main cabin includes Double bed and en-suite. Hi-Fi, Radio AM/FM and TV.